Ysgol Ffordd Dyffryn is located in the seaside town of Llandudno in North Wales. I have already visited the school several times, performing shows and taking workshops. I love the enthusiasm of the staff and students! 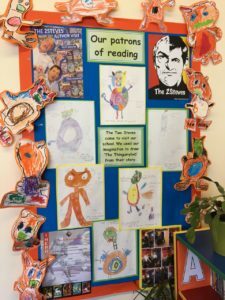 Here’s a great Thingumybob display by KS1 students in the school library!